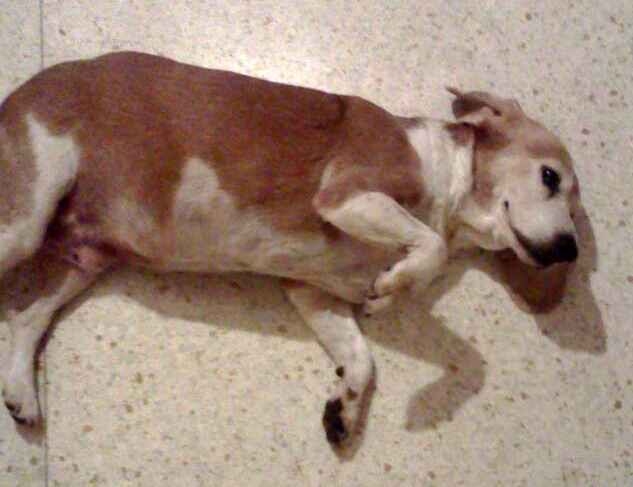 Hearts to the Rescue: *Luling, Louisiana: Beagle being beaten - taken in by good Samaritan - please read, need help. *Luling, Louisiana: Beagle being beaten - taken in by good Samaritan - please read, need help. 8-4-12: RESCUED!! Thank you to Gary and Cindy Peterson of Hokie Hounds for stepping up for Sugar and the same appreciation to Dolly Dickson and her family for risking their home because they could not look away from what Sugar was going through. They took her in to keep her from being beaten, but the landlord won't let her stay. Please help find a good home for Sugar. *From Dolly: Hi, I have a huge problem and I am hoping that you can help me or make a suggestion. We live in Luling ,La., which is about 30 minutes to the West of New Orleans. There is an older female beagle who roams our neighborhood. She is always FILTHY and starving. We feed her and give her baths and so do some of the other neighbors. She is the sweetest dog ever. After asking around about her identity, we found that "Sugar"s owner passed away about a year ago and that her grandson was supposed to be taken care of her.Several of the neighbors have called him when she got out of his yard, only to have him pick her up and severely beat her, then tie her up in his back yard for weeks, until she breaks free, and the same, viscious cycle begins again. About 2 weeks ago, we saw her roaming around again, so we gave her a bath and brought her in the house.We are not supposed to have any animals because we are renters and it is not allowed. One of my kids accidently left my door open yesterday, she got out, and sure enough, someone called the owner and he came to get her.We watched as she sheepishly cried and refused to go to him as he called for her, then he picked her up by her collar and flung her into the back of his truck, which was a covered end, so she could not get any air.My husband stopped him and asked if we could have her if he doesnt want her.He agreed.She was scared to death to come out of the back of that idiots truck, for the fear of being beaten again. When my husband finally was able to pick her up, she buried her head in his chest and refused to look at the owner. She was SO terrified of him. Now, I have a huge problem. The guy has willingly given her to us, but we are not allowed to keep her. I have been asking everyone and posting on facebook, etc, but no takers.We have to find a good home for her....Someone that will love her.She deserves that.She is such a good dog.I so wish that we could keep her. She is excellent with kids and other animals, even cats. She is also housebroken. She would be well suited with an elderly person who needs a companion, or with a family, as she loves kids. I don't think she is still able to get pregnant. Either she is already spayed, or she is just too old. She has been running around the neighborhood for quite sometime and has never been pregnant in that time. She is extremely friendly! We have been keeping her indoors, so she is safe now. I will keep her until we can find a good home or rescue for her, which hopefully will be soon, before my landlord sees her again! I have tried to talk to my landlord, but can't keep her. Another problem is that there is no fenced yard. I would really like to find a home for her, not a shelter. Please give me any suggestions that u can. I dont know where else to turn. Fantastic and heartwarming. Thanks to EVERYONE who made this happen. She'll now be getting the peace & love she so deserves.